to make a heavy demand on everyone's time, and an especially heavy demand on the treasury. After considerable discussion at several meetings, it was decided to take a big jump and purchase our own mimeograph and equipment. This machine was acquired on a monthly installment basis and cost the chapter $50. After a short time it found a permanent residence at Russ Hodgkin's home, at the other end of the city. THE NATIONAL FAN FIELD at that time was going into a brief and temporary lull; at least that is the way I recall it from the Los Angeles end of the continent. FANTASY MAGAZINE had just folded officially, as had the TESSERACT and the SCIENCE FICTION DIGEST. Furthermore, the last vestiges of the Gernsbackian Science Fiction League was fading away under the new ownership of Margulise and Co. F.A.P.A. had hardly been set rolling; I had received an invitation to join but turned it down on the grounds that the contents of the first mailing were the most abominable trash I had yet seen. With the exception of a few hektographed magazines such as Baladonis' COLLECTOR, Wiggens SCIENCE FICTION FAN, Richard Wilson's THE ATOM, and a very few others, late 1937 saw a sort of hush. An ebb-tide between one epoch and another was in progress. I think it marked at that time the close of the era of old-style science-fiction fans...the readers and collectors who corresponded, and many of which were valid literary critics. Publishing in the amateur fan field prior to 1938 was of a much higher quality than the present day new fan imagines. For one thing, there were more printed magazines and they came out regularly. And the contents were of a nature to warrant thorough reading. In adition, the authors of the day were willing to contribute, perhaps because most of the editors then were older, mature persons. The old FANTASY had set the standard for years. 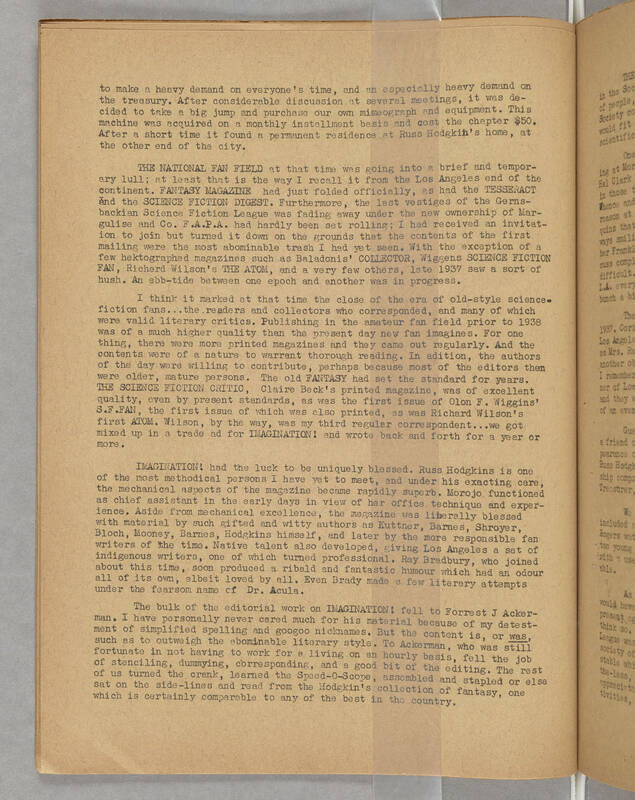 THE SCIENCE FICTION CRITIC, Claire Beck's printed magazine, was of excellent quality, even by present standards, as was the first issue of Olon F. Wiggins' S.F.FAN, the first issue of which was also printed, as was Richard Wilson's first ATOM. Wilson, by the way, was my third regular correspondent...we got mixed up in a trade ad for IMAGINATION! and wrote back and forth for a year or more. IMAGINATION! had the luck to be uniquely blessed. Russ Hodgkins is one of the most methodical persons I have yet to meet, and under his exacting care, the mechanical aspects of the magazine became rapidly superb. Morojo functioned as chief assistant in the early days in view of her office technique and experience. Aside from mechanical excellence, the magazine was liberally blessed with material by such gifted and witty authors as Kuttner, Barnes, Shroyer, Bloch, Mooney, Barnes, Hodgkins himself, and later by the more responsible fan writers of the time. Native talent also developed, giving Los Angeles a set of indigenous writers, one of which turned professional. Ray Bradbury, who joined about this time, soon produced a ribald and fantastic humour which had an odour all of its own, albeit loved by all. Even Brady made a few literary attemps under the fearsom name of Dr. Acula. The bulk of the editorial work on IMAGINATION! fell to Forrest J Ackerman. I have personally never cared much for his material because of my detestment of simplified spelling and googoo nicknames. But the content is, or WAS, such as to outweigh the abominable literary style. To Ackerman, who was still fortunate in not having to work for a living on an hourly basis, fell the job of stenciling, dummying, corresponding, and a good bit of the editing. The rest of us turned the crank, learned the Speed-O-Scope, assembled and stapled or else sat on the side-lines and read from the Hodgkin's collection of fantasy, one which is certainly comparable to any of the best in the country.